Welcome to Maple Hill Pygmy Goats! I am glad that you have found this site and I hope that you enjoy it. My name is Lexie Phillips and I have been raising pygmy goats for fifteen years. They are my favorite hobby and always enjoyed showing them in 4-H. Now that I am older, I still raise them for my family to show, but I offer them for sale too. I often help with the pygmy goat show at the Effngham County fair and it is a growing show! I hope that you find this site informative and helpful. Pygmy goats are a small breed of goats that make excellent pets. They come in many colors and are well known for their short, muscular appearance. 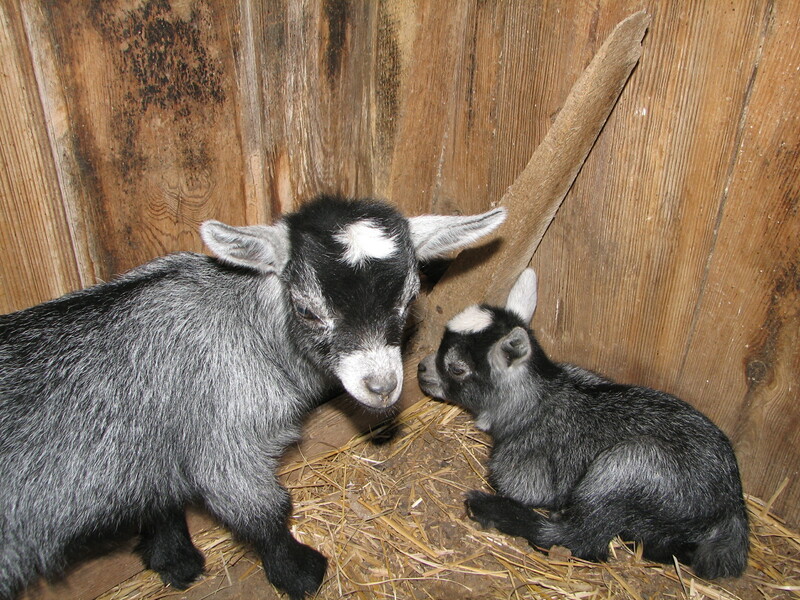 Pygmy goats make great pets for all ages because they always remain fairly small. They have great temperments (especially wethers) and are fairly cheap as far as animals go. They are also low maintenence; besides needing annual wormings, boosters, and hoof trimmings, there is not a lot of extra work involved... From there on, it is all fun! Goats love to run, jump, and play. It doesn't matter what you put in their pen, they will be on it! If you are considering purchasing a goat, there are many questions to ask yourself. While they are not hard to care for, they are a daily responsiblity. If you are looking for a 4-H project, I recommend starting out with a doe and a wether (that is what I started with, Sweet Pea and Madigan). Although I am pretty busy, I will try to keep this site as updated as possible. When new kids are born, I will post pictures of them. If you have any questions, feel free to email me and I will do my best to answer your questions! Down here, I will put announcements about births, new goats, and anything else exciting going on here at Maple Hills! unfinished portions of it! My herd changes almost daily!